BOSTON, Mass. – Canton went into Sunday afternoon’s Div. 2 state championship game against Tewksbury looking to put a fitting exclamation point on a historic season. 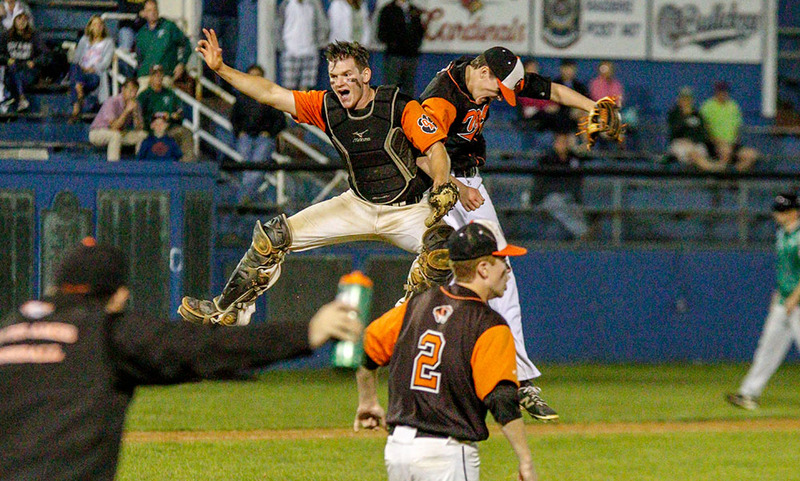 The Bulldogs were trying to be the first team since Hanover won the D3 title in 2001 to finish a season unbeaten, be just the fourth team to win 25 games in a single year, and to earn the program’s first title since 2010. Despite all that pressure, the Bulldogs did what they have done all season long – they found a way to win. 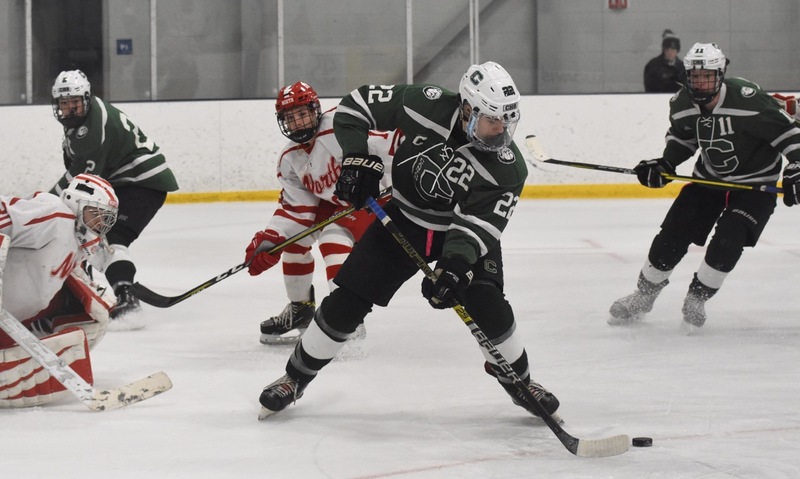 Behind a hat trick from junior Johnny Hagan and a goal and four assists by senior Ryan Nolte, Canton dispatched Tewksbury 6-2, closing out its season at 25-0-1. Entering the playoffs unbeaten put a giant target on Canton’s back, but it seemed only to motivate the Bulldogs, who outscored opponents 29-3 during their tournament run. 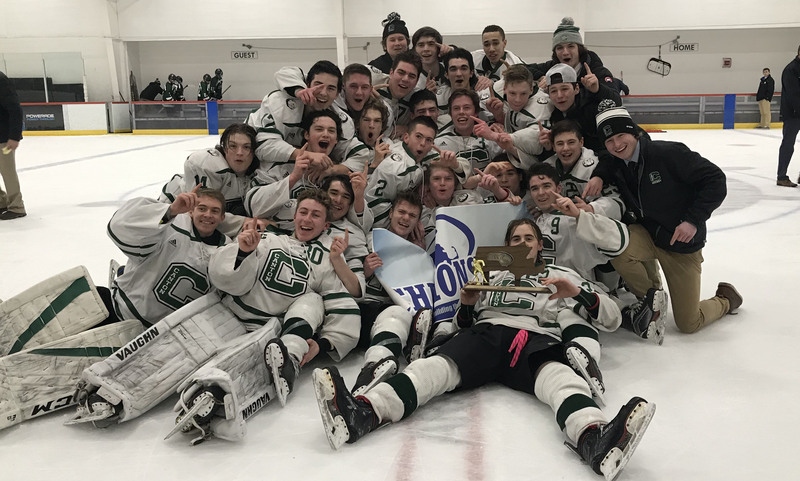 Canton scored six against Norwood in the D2 South semifinal, eight against Westwood in the final, and then another six against the Redmen on Sunday. Skating on the big ice and bright lights of the Garden can take some getting used to and it seemed like the Bulldogs needed a couple shifts to find their legs. Once they found their footing in the first period, the Bulldogs took control of the game. 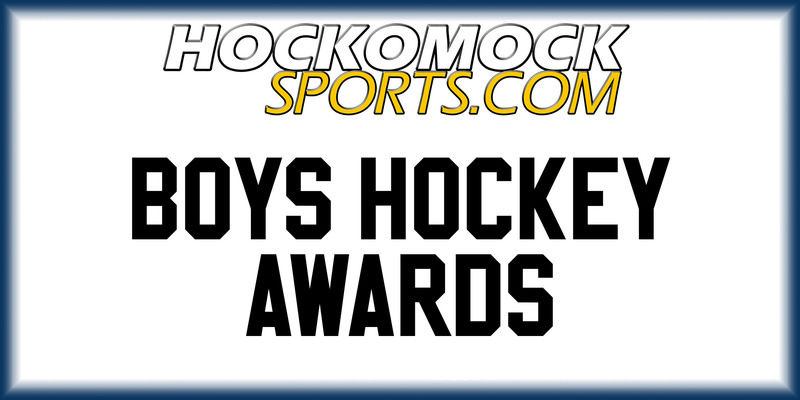 Shane Marshall had the first chance on a feed from behind the net by Tommy Ghostlaw, but Tewksbury goalie Patrick Letourneau kept his pads down to block a pair of shots. Canton grabbed the lead five minutes into the game. Seconds after Nolte was denied on a shot from the left wing circle, Owen Lehane’s shot from the point rebounded to Timmy Kelleher for a tap-in. Just about 90 seconds later and the lead was doubled. Ronan O’Mahony swung the puck across the blue line to Jack Connolly, who patiently crept towards the face-off circle before firing a low wrister just inside the post. Nolte added a third goal with a shot from the slot just 16 seconds later. Three goals in less than two minutes had the Bulldogs thinking the title was as good as won. The Redmen tried to cut into the lead early in the second period when Kyle Morris got free on a shorthanded breakaway but Mike Staffiere came through with a clutch glove save. Two minutes later, Canton got its own shorthanded odd-man rush that Tewksbury struggled to clear, the puck falling right to Hagan in the slot and he calmly put it away. Tewksbury was down four goals but was playing much better in the second period. Staffiere again had to come up big to stop a pair of chances from the edge of the crease. The Redmen finally found a breakthrough after Morris stole the puck behind the Canton goal and played it out in front to Aaron Scott. Chris Lavoie and Marshall nearly had instant responses for the Bulldogs but it remained 4-1 after two periods. The lead got smaller early in the third. Kyle Lombardo got a piece of a Campbell Pierce shot from the point, redirecting it past Staffiere to make it 4-2. With 7:19 remaining, Canton added a big insurance goal on a power play. Nolte skated off the half-boards and picked out Hagan cutting to the goal. The junior took a touch to control and then buried his shot over the shoulder of Letourneau for a 5-2 lead. Tewksbury had a goal disallowed for an offsides call and with three minutes left decided to pull its goalie. Hagan sealed the title for the Bulldogs when he beat a defender to a loose puck and scored on the empty net. 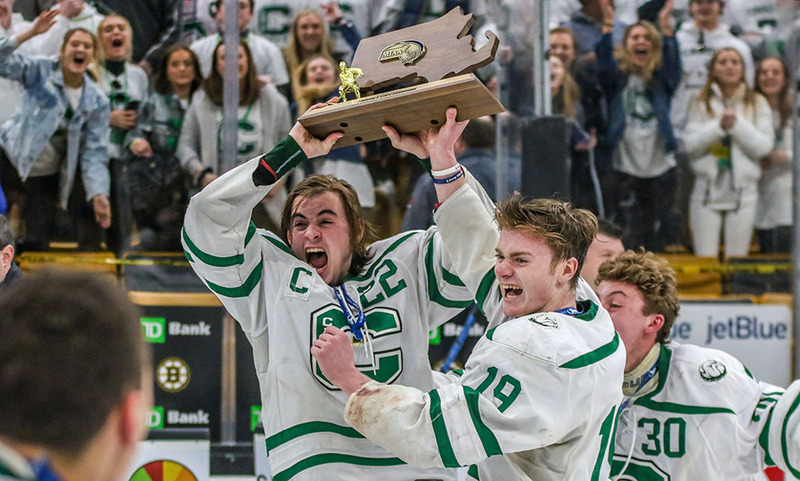 One of the storylines throughout the playoff run was Canton bouncing back after being snubbed by the Super 8. Shuman, who played on the unbeaten 1998 Catholic Memorial team that won the Super 8, dismissed the idea that the Bulldogs were motivated by not being selected. BUZZARDS BAY, Mass. – Canton is no stranger to playing important games at Gallo Arena. Coming into this year’s playoffs, the Bulldogs had played nine times in Bourne since winning the state title in 2010, reaching at least the sectional semifinal every year but one, but had only won twice at Gallo in that span. 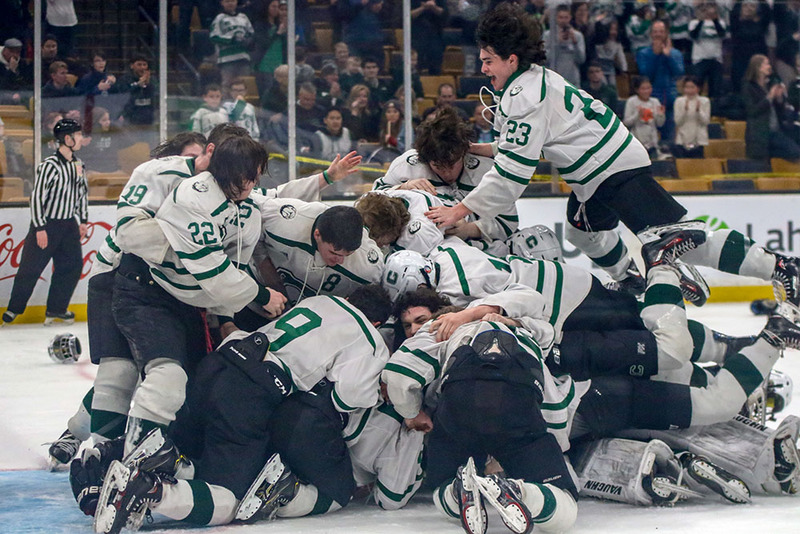 After a convincing win against Norwood in the semifinal, Canton had the opportunity to end nearly a decade’s wait for a return to the TD Garden and set aside recent history in this venue. The Bulldogs did that in style, dominating second-seed Westwood from start to finish in the Div. 2 South final and putting an 8-0 exclamation point on their run to the final. If there was any nervousness in the Canton locker room, the players certainly didn’t show it on the ice. The Bulldogs recorded the fist nine shots of the game, held an 18-5 advantage in shots after the first period, and needed only 43 seconds to get ahead. Johnny Hagan had a wraparound shot saved by Westwood goalie Ben Goodrich and the rebound skipped out to Owen Lehane at the blue line. His wrister snuck inside the post for the early lead. Canton never looked back. Chris Lavoie nearly doubled the lead with a shot from the slot, but Goodrich made a big stop with his shoulder. Staffiere (19 saves) didn’t have much to do in the first but he was forced into a blocker save on a snap shot by Colin Fahey. The Bulldogs made their pressure pay with 3:19 left in the first, Ryan Nolte took his time in the left circle and fired a low shot that squeezed inside the near post. After dominating play and grabbing a 2-0 lead in the first, Canton put the game away in the second. Just a minute after the break, Timmy Kelleher blocked a puck at the blue line and then raced into the offensive zone to collect it. He dropped a pass off to Hagan in the slot and the junior took a look up and sniped the top corner on the stick side. Only 23 seconds later, Ryan Colby added a fourth. The top line of Hagan, Nolte, and Kelleher was controlling the game and Westwood had no answer. With 12:10 left in the second, that trio combined for the fifth of the afternoon. Hagan had the initial shot and the rebound was pushed on goal by Nolte with Kelleher on hand to force it over the line. There was no letting up from the Bulldogs. Lavoie was the lone forechecker but he managed to swipe the puck from the Westwood defender on the right side of the net. The junior center brought it back to the other side and threw a puck in front looking for Tommy Ghostlaw in the crease, but it deflected off a Westwood player and looped into the goal. Three minutes into the third period, Kelleher again showed the benefit of going to the net, as he followed up a chance by Nolte and knocked in the rebound to make it 7-0. Seven minutes later, Tommy Vaughan got in on the action. Eamon Kelly’s shot was going wide of the net, but it glanced off Vaughan’s skate and snuck in. 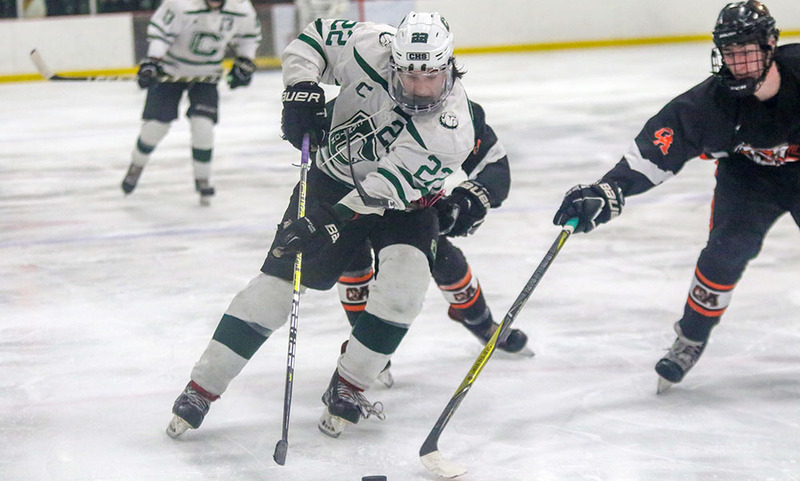 Canton (24-0-1) heads to the TD Garden next Sunday and will face either Boston Latin or Tewksbury in the state championship game. It has been an impressive run through the sectional for the Bulldogs, which didn’t allow the disappointment of not being chosen for the Super 8 deter them. BOURNE, Mass. – The game was scoreless for 12 minutes when Canton senior center Ryan Nolte won a face-off to the right of Norwood goalie Austin Reardon. 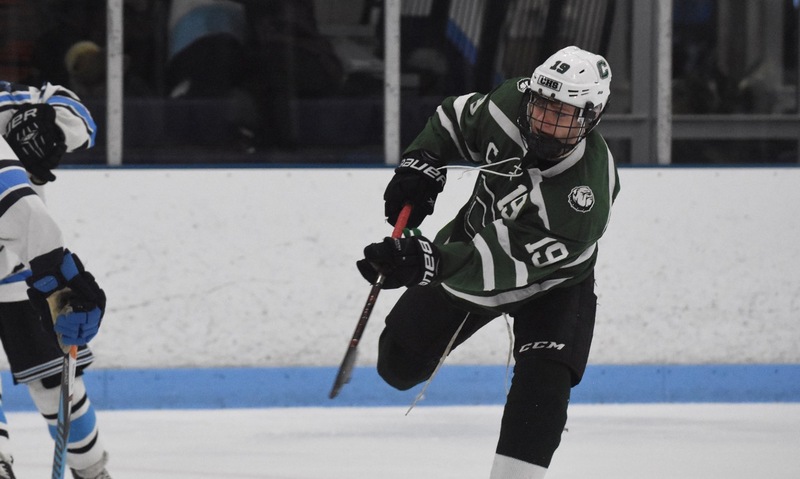 Nolte kept possession of the puck, dragging it through the legs of a Mustangs defenseman, brought it back to his forehand and then roofed his shot from a tight angle. It was a stellar opening goal for the unbeaten Bulldogs, eased some nerves for the top seed, and opened the floodgates for Canton in Tuesday’s Div. 2 South semifinal. Once the Bulldogs got their noses in front, they were relentless, scoring four times in the second period and rolling to a dominant 6-1 victory over the No. 5 seed. Canton got off a to a great start and looked dangerous every time that it got into the attacking zone. Timmy Kelleher created the first good chance with a big hit behind the net to win back possession and he fed it out in front for Johnny Hagan, whose shot caught a piece of Reardon’s blocker and then the post. Norwood nearly took advantage of a turnover to score the opener, but was denied by a hustling back-check from Tommy Ghostlaw. The Bulldogs then got a chance in front when Tommy Vaughan angled in from the near boards and picked out Colby Ciffolillo, but Reardon again made the stop. Finally, with 2:55 left in the first, Canton’s pressure paid off with Nolte stepping up and going bar down on a wrister to put the Bulldogs in front. The Bulldogs had to clear off two penalties, including one that stretched into the second, but going on the penalty kill hardly slowed their momentum. Chris Lavoie had a chance from the slot that Reardon spilled but managed to recover in time to deny Ghostlaw on the rebound. A little more than two minutes later, Lavoie got on the board to double Canton’s lead. The play was made by Shane Marshall, who managed to block a clearance at the blue line under pressure, got enough space to get his head up and flicked a pass to Lavoie in the high slot. The junior went blocker side to make it 2-0. Canton added a third a minute later when Nolte held off a check behind the net and saucered a pass to Hagan right in front and the junior didn’t miss from close-range. The duo combined for the fourth goal of the night as well. Hagan ripped a wrist shot off Nolte’s face-off win. The puck trickled behind Reardon and Nolte reacted first to prod it over the line for a shorthanded goal. On the same power play, Norwood got one back. Mike Staffiere made the first two stops but the puck slid off to his left and, with the goalie prone in the crease, Chris Martin was in the right place to tap it home. Any momentum for the Mustangs lasted less than two minutes. Owen Lehane lined up a wrister from the blue line that snuck through traffic and, with the help of a deflection off a Norwood player in front, snuck inside the post to make it 5-1. Reardon needed to be at his best to keep it a four-goal game early in the third, as Hagan set up Kelleher at the back post only for the goalie to get a toe across. With 8:32 to go, freshman Eamon Kelly burst through the middle of the Norwood zone, split a pair of defenders and the lifted a backhand shot stick side to get Canton’s sixth. Nolte had a chance at his hat trick after a pinpoint three-line pass from defenseman Declan Pfeffer, but he couldn’t get his shot over Reardon’s glove. Undeterred, Nolte then popped up in his defensive zone, chasing back when the Mustangs got a three-on-one and getting a poke check in to deny a scoring chance. While the offense will get the headlines, the Canton defensive corps had another impressive performance. The Bulldogs have allowed only 21 goals in 24 games this season and the top two pairings of Jack Connolly and Ronan O’Mahony and Matt Martin and Lehane, held Norwood to only 12 shots through the first two periods and kept the front of the net largely clear for Staffiere (20 saves). 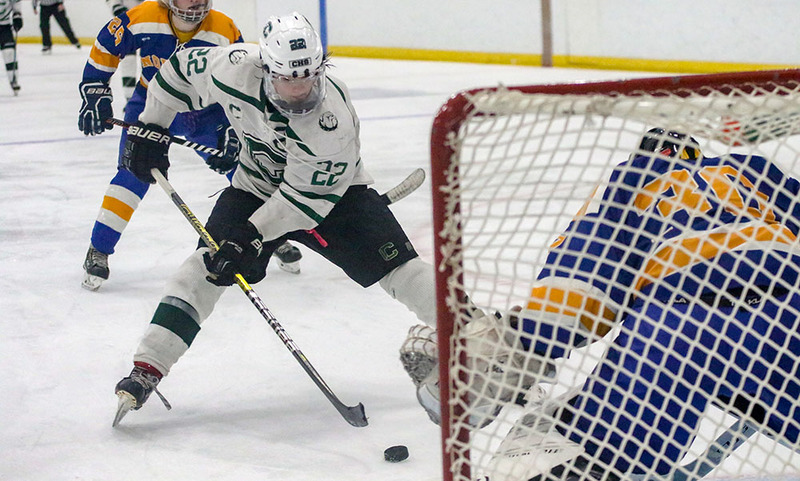 After three straight losses at the semifinal stage, Canton boys hockey (23-0-1) is back to its first South final since 2015 and will face No. 2 seed Westwood (the same team that they faced in the 2015 final and the team that shares a home with the Bulldogs at the Canton Ice House), after the Wolverines beat Medfield 3-2 in the first semifinal of the night.